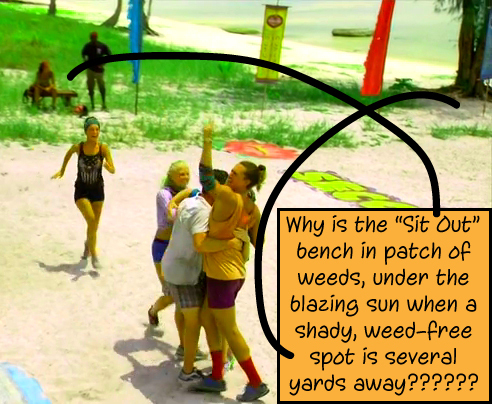 This week on Survivor… After returning to camp after Tribal Council, Woo thanks everyone for keeping him in the game. He’s hoping that their tribe will be stronger now; four Tribals in 11 days has been rough and he doesn’t want to schedule another date with Jeff anytime soon. Woo is also lucky that Abi voted in his favor, but if he votes against her again… Abi says to us that he will be dead to her. Later in the evening, Savage and Tasha have a sit-down; they can’t believe what they’ve done; the conditions, being out-numbered… Tasha’s just going to keep on keepin’ on, though. It’s all part of the game. The next day at Bayon, Kimmi, Borneo Kelly, and Monica are out collecting food; they provide the boys with protein and they are loving it. When Kimmi finds some big clams, Monica voices a concern she has – She doesn’t want to take all the clams back to camp; they are depleting their little patch of ocean. Kimmi plays this off well, but later she vents to us. Monica is really testing her patience, which she is consciously working on having more of in this game; she’s older now, wiser, but ugh! Come on in, guys! It’s time for a reward challenge! Up for grabs this week is comfort. The first place winners will receive the deluxe package: chairs, pillows, blankets, a hammock, candles and some refreshments! Second place winner gets a tarp. To win this challenge, each tribe will choose one player to be rolled down a course in a barrel, stopping at three stations where the barrel-rider must retrieve a bag of ball by uncoiling a rope. After all three bags have been collected and the barrel has been placed upon it’s final cradle, one person must play some skee-ball. First two tribes to successfully toss six balls into six divots on the “skee-ball” field wins reward AAAND go! In the barrels; Woo, Kelley, and Monica – And Monica cannot uncoil those ropes fast enough. Ta Keo and Angkor are first to reach the skee-ball range. Shooting for Angkor – Woo, for Ta Keo – Keith, and when Bayon finally reaches the range, Jeremy takes on the task of shooting. And it is neck-and-neck in this part of the challenge… for Ta Keo and Angkor, then Spencer decides to take over for Jeremy and bam bam bam, lands three in a row to tie it up at 4-4-4. Finally…Keith shoots the winning goal for Ta Keo and everyone is really excited for comfort, even though Joe is fully capable of making hammocks… So it’s down to Woo and Spencer, who are both laser-focused on those holes, but all the hours he logged at Chuck E Cheese really paid off because WOO lands his last ball, winning a little comfort for his downtrodden Angkor tribe. After the challenge, Ta Keo relishes in their refreshments and comforts. Terry is just beside himself with joy – it’s like a Survivor camping trip! They keep winning, they have plenty of food in the grocery store that is the ocean, and they are just living the dream on Ta Keo beach. Terry loves it. He just loves it. 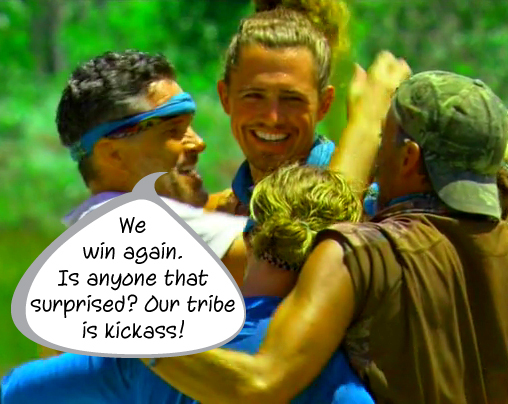 While he’s out fishing, Joe makes a move with the rest of the tribe, which, in case you don’t remember, is comprised of Kelley, Keith, Ciera, and Kass – he wants to talk about merge time. Everyone was gunning for him when the merge hit in his first season and he’s worried about the same thing happening during his second chance. Ciera would like a good, strong, five-person alliance and look at that – they’ve got five people right there and I dunno who said it, but at least one of them has no intention of voting Joe out right after the merge. Kelly loves this five, she’s been throwing Terry under the bus since the switch and she feels good about this group – same goes for Keith. Keith is very happy that people are coming to him to be part of a large group instead of a small one that doesn’t have any power. Kass reminds everyone to keep Terry feeling good, though… Over at Bayon, they are a little bummed about not winning reward, but it’s cool. Jeremy and Spencer load up the boat and head to do a little fishing. 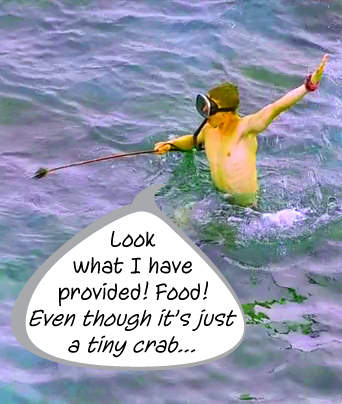 Spencer never thought he would be the provider-type like an Ozzy or even a Joe, but he’s doing it now and he’s super proud of himself – he’s not living his Survivor dream by proxy anymore, he’s really living it. At Angkor, they are happy with their win, even if all they won is a tarp it’s like winning first place to them. Later, Woo is asked about his mom’s heart condition and he shares the story of how she fought hard and got lucky with a transplant heart. His mom is his second chance inspiration – she got a second chance and so did he and he’s not going to waste it. After this touching, personal moment with the tribe, Woo goes off to have a few minutes to himself or to fish or something and as soon as he’s gone, Abi relates her own story. Her grandma didn’t get so lucky. She lost an aunt really early too and she is a little annoyed with Woo. She thinks he told that story just to gain favor with people. Later with Tasha, Abi voices her opinion on the matter again – he just told that story to get sympathy from people. Tasha tolerates the conversation, but keeps it real with us. Working with Abi is exactly that – it’s work. It takes everything in her to work with Abi. 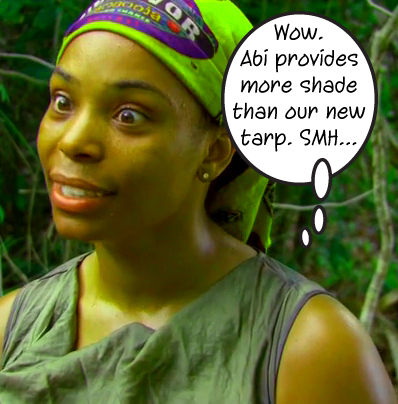 Woo, on the other hand, it totally easy breezy – he’ll take walking order right before Tribal with no qualms, but Abi… Not so much. Tasha doesn’t want to play emotionally, she has to do what’s best for her game, but Abi is a ticking time bomb and she might have to cut the wires connecting Abi to the game before she detonates throwing Abi drama in all directions. Come on in, guys! It’s time for Immunity and holy crap, Survivor! You’ve had more big builds in the last few seasons than I’ve ever seen! For this challenge, one person from each tribe will run up a mammoth structure via a ladder, a wobbly bridge, and a rope ladder to reach the top of the platform where they will shoot sandbags at targets using a giant slingshot. First two tribes to hit all five targets raising all five flags wins Immunity. And GO! First up to sling some shots is Spencer, Joe, and Savage – Joe is the only one to hit a target and as soon as Jeff gives the go ahead, Keith makes his way up the tower. Everyone has to shoot at least once… After Savage and Spencer hit some targets, Woo and Borneo Kelly take the reigns and Kelly connects on her first shot. Just as Stephen’s coming up to replace her, Woo hits a target and Tasha is quick on her feet to replace him. Unfortuntely, Stephen does hit a target – for Angkor, which will count. Tasha lands a hit on her first sling, scoring a fourth point for her tribe, Abi takes her turn, but quickly decides to step down and let Woo take over to nail that last target and he does! 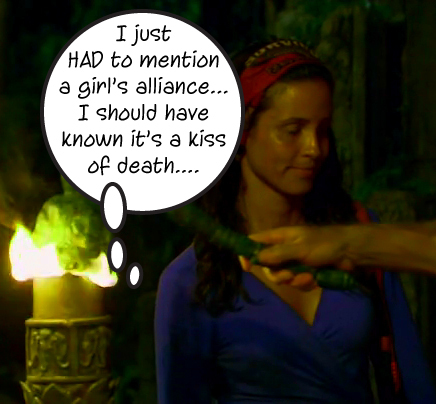 Angkor wins the first Immunity spot. Bayon and Ta Keo are both still tied at three targets each with Joe and Borneo Kelly shooting; Joe lands a fourth score for Ta Keo and after two failed shots, Spencer joins Keith in the climb to the top of the tower and bam! Keith lands the fifth shot for Ta Keo sending Bayon to Tribal Council. So, Spencer is really nervous. He’s hoping that some of the bonds he has will keep him in the game. When Bayon returns to camp, Stephen apologizes for hitting one of Angkor’s targets; no one seems too upset about it. He’s not the only one that sent a sandbag flying in the wrong direction – he’s just the only one that hit a target, but at least you hit a target on your first pull, Stephen! Since there are four original Bayon with Borneo Kelly and Spencer, the question Jeremy is asking himself is who should he trust more? Alone with Monica and Stephen, Jeremy asks them both – “gun to your head, who do you vote for?” – and they both say Kelly. 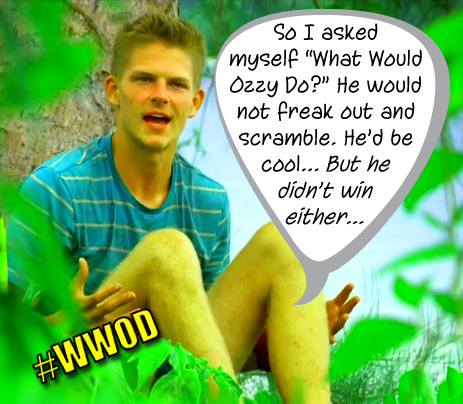 Later, Spencer, going against everything his Survivor brain wants him to do, is playing it cool, confident, and composed. He knows these people are looking for loyalty and a chill attitude so he’s playing the part. Jeremy and Stephen basically tell him he’s good while they chat around the well then they all head back to camp. Meanwhile, Monica is telling Kimmi that she thinks they should keep up the girl numbers; she doesn’t want to vote out Kelly and Kimmi’s radar goes berserk. And as I sat at work watching this episode, I was hoping hoping hoping that my slow night would continue and that no one would show up to buy booze until after 8pm, central. So… Kimmi has figured out that Monica is playing for Monica and she immediately approaches Jeremy and Spencer with her concerns. She’s afraid of Monica flipping, the boys are concerned about the same thing, judging by the looks on their faces. 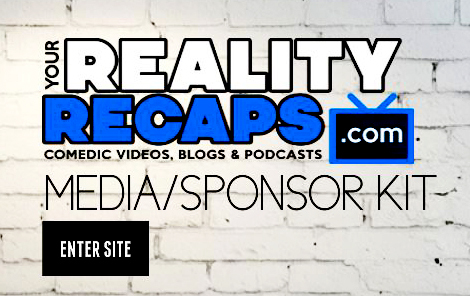 Kimmi makes a very compelling argument too – if Monica is all girl power, what’s stopping her from approaching Kelly to vote out Jeremy or Stephen? The boys are alarmed now too and later, Stephen and Jeremy talk privately – yes, the Monica situation is threatening, but what kind of message does that send to the rest of the original Bayon members? Do they want to risk voting out an original Bayon only to have it piss off the rest of the original Bayon members? Sure, Monica is gonna flip flop, but… It’s a tough decision. And even though the neck on the line seems to be either Monica or Kelly, I’m still scared for my Spencer! And we’re off to Tribal! Everyone that has yet to dip their torch to get fire does and we start Tribal Council… Jeff asks Stephen about how Tribal Council can be a good thing. Yeah, it can be a good thing since it shows where the trust is – and Blah blah blah… Kelly is fighting to stay in the game, Spencer is too, Monica is totally clueless about what is happening. Talk of Old School Vs. New Schools I brought up and Spencer is questioned – he’s old/new school and he’s all erratic. Jeff also brings up the vote and how it impacts other people playing on other tribes and Kimmi gives Monica the open to start defending herself – Kimmi says that no one else knows what goes on at camp if they aren’t there, but Monica is sure that tonight’s vote is locked and blah blah blah, it’s time to vote. Spencer and Kelly vote for each other respectively, which is very telling in respect to how much the original Bayon trust Spencer and Kelly – they are still Bayon Strong, even though the vote reveals they have turned on Monica because she’s OUT! She’s outta the contest and her face… She’s shocked and so are Spencer and Kelly.